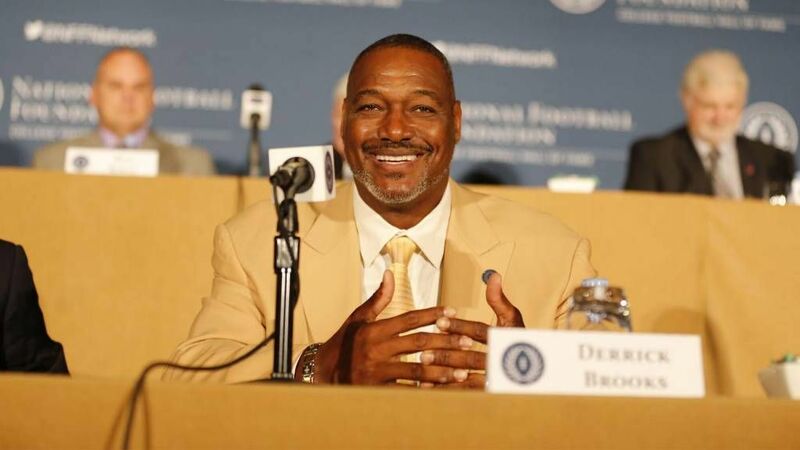 Derrick Brooks became the seventh College Football Hall of Fame inductee from Florida State tonight at the annual National Football Foundation and College Football Hall of Fame induction in New York City. Brooks, who is already a member of the NFL Hall of Fame, joins former Seminole players Ron Sellers, Fred Biletnikoff, Charlie Ward, Deion Sanders and Ron Simmons in the College Football Hall of Fame. Former FSU head coaches Bobby Bowden and Darrell Mudra have also received college football’s top honor. Brooks was the USA Today High School Defensive Player of the Year as a senior at Washington High in Pensacola, Florida. He lettered all four years at linebacker for the Seminoles and earned consensus All-America honors as a junior (1993) and senior (1994). He led FSU to its first national championship as a junior with a win over Nebraska in the Orange Bowl. Remarkably, the Seminoles lost just five games over Brook’s four-year career at FSU. In addition to being a superstar on the field, Brooks was just as outstanding in the classroom where he was a two-time Academic All-American and was later inducted into the CoSIDA Academic All-America Hall of Fame. He was a NFF National Scholar Athlete as a senior. Brooks went on to an equally spectacular career in the NFL with the Tampa Bay Buccaneers. He was selected in the first round of the 1995 NFL Draft and played 14 seasons with Tampa. A nine-time All-Pro selection, Derrick was the 2002 NFL Defensive Player of the Year and earned a Super Bowl ring in Super Bowl XXXVIII. Once again Brooks’ impact off the field was as impressive as his efforts on it during his NFL career. He started and is still heavily involved in a number of charities including his original work with the Brooks Bunch. He was the 2000 Walter Payton/NFL Man of the Year, the 2003 Bart Starr Award winner, the 2004 Byron “Whizzer” White Award winner, and the NFL Players Association presented him with the JB Award in 2008 in recognition for his commitment to the community. Brooks’ jersey number is retired at both Florida State and in Tampa Bay and in 2014 he was voted into the NFL Hall of Fame on the first ballot. He holds bachelors and masters degrees from Florida State University and opened the very first traditional charter high school in the Tampa Bay area.